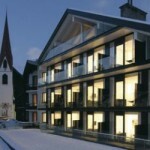 The AlpenMedHotel Lamm is situated in the picturesque mountain village of Seefeld, in the Austrian Tyrol. Based around a cobbled square, a 15th century church happily rubs shoulders with this modern hotel. Typical Tyrolean buildings with wooden balconies line the streets like a film set with a Hansel and Gretel storyline. At any moment one expects a little gnome to come out of one of the houses, set up his shoemaking last and get to work. The hotel is smart and stylish, decorated with original art sculptures, which gives it a quirky ambience. The downstairs bar with mood lighting provides a good place to congregate. The rooms are in monochrome: dark wooden floor, black bed, gleaming white bedding and minimal furniture. A full length window with patio door to the balcony allowed the light to flood in and the view of the mountains to be enjoyed. It should have felt cold but for some reason it didn’t; rather it was restful and calm. The bathroom (with separate toilet) had a grey marble floor, frosted glass walls, a walk-in power shower and large basin with matching tub. A magnifying mirror, quality toiletries and hairdryer completed the scene. The restaurant had windows looking out onto the square. Dinner here was good but not pretentious. Nothing takes the edge off decent food more than unnecessary pomp and ceremony. In the lounge area was a help yourself coffee and tea maker; during the afternoon the Abend Kuchen appeared; several delicious cakes including strudel, all impossible to ignore. A feature of the hotel is the medical spa. The hotel has applied for a licence to operate as a clinic and this should be granted soon. The recently renovated spa really is an oasis of calm. The gleaming metal swimming pool, with Jacuzzi and whirlpool, recovery room upstairs with waterbeds and just the clouds and sky to gaze upon through the glass roof and a myriad of relaxing treatments makes this a magnet for people suffering from “burn out”. A special feature of the spa is the Cryotherapy chamber. Under strict supervision, guests are encouraged to endure temperatures of below -110 C for three minutes. The test samples they have are too small to make a judgement, and people react differently, but the fact that people are coming back for more would suggest that there is a benefit to be had. You don’t need to be suffering from stress or in need of cryotherapy to justify a visit however – a need to be somewhere special, to have some “me time” is sufficient. And the massages really are divine.